Who is this Antenna for? You cannot use a CB radio without an antenna. Thanks to the antenna’s great significance in communication with other CB radio users, and for your safety/ security you have to find a remarkable antenna. So, how do you choose one CB radio antenna over another ? What makes you certain that yours is the best choice; noting the fact that the factory truck antennas are incompatible with the CB radios? Lucky for you, we did all the research for you, and this Wilson 5000 Magnet CB Antenna qualifies as our best CB antenna. This Wilson 5000 Magnet CB Antenna, a product of Wilson – a renowned brand in the manufacturing of CB antennas is a top performer and certainly the best CB antenna available on the market. Wilson has been in the industry for over 30 years, providing the best-engineered quality of mobile CB antennas. As the top-performing base loaded CB antenna for automobiles, it uses a basic design as that of the Wilson Trucker 5000. It also has an exclusive low loss coil with exceptional performance qualities. As a result, this 5000 Magnet CB antenna can withstand tough environmental conditions. This high-performance, weather-resistant, and long-range CB is ideal for anyone looking for a CB antenna that is easy to install on any car. It is also suitable for truckers and drivers of commercial vehicles. If you intend to drive in extreme winter conditions, then you should get this antenna as it is reliable in severe weather. It has a weather channel ready for use once you install it. 17-7 SS whip: this antenna is also a whip antenna which means that it is a base/ centre loaded antenna that is topped with an elongated steel whip which is easily tied down when it isn’t in use. The presence of a whip makes the antenna suitable for the magnetic antennas used by professional drivers. You need to mount the antenna high on the vehicle though. High-performance: As a top-performing base-loaded CB antenna, this Wilson 5000 Magnet antenna comes with an exclusive low-loss coil, the reason for the antenna’s remarkable performance. By using 6-gauge solid copper wire and perfectly designed coils, this antenna works efficiently. Other than copper, which is a great RF conductor, this antenna also has a heavy silver plating which is an even greater RF conductor – these metals present the best of both worlds, and with these design characteristics, this antenna is the best of all base-loaded antennas. 3/16″ Copper-Silver Plated Wire: This CB antenna features a 3/16″ copper silver plated wire, as well as a specific floating coil which does not ice up or even stops working in severe winter. The coil windings cannot crack from freezing either. High wattage: This antenna has a rating of 5,000 watts AM and 20,000SSB meaning that this antenna is perfect for the high-powered radios. Screw off coil: This coil allows for the separation of the antenna at the coax-wired base resulting in increased convenience when entering the low-clearance areas. The screw-off coil is also necessary for storage of the antenna temporarily. High-impact Mobay thermoplastic: For durability, this antenna is made of a high-impact Mobay thermoplastic material which makes it the ideal choice of antenna is tough conditions and on big trucks. Channels: it comes with the weather channel ready for use so that you can use the antenna as soon as you install it. All-in-one antenna: this antenna comes inclusive of the magnet mount and the 62” whip antenna, as well as a 17-inch coax. Compatibility: This antenna is compatible with all CB radios as the magnet mount attaches to any metallic surface, holding tight even at high speeds. Range: it works best within a 5-7mile range. Looking at the design features and the performance of the Wilson 5000 Magnet CB antenna. It is the best CB antenna available. Even though it costs most than its counterparts, it holds more power which makes it ideal for use in extreme weather conditions, over long distances. Worth the price – if you are looking for a high-quality magnetic mount CB antenna, get this antenna. I have had mine for a few years now, and though it costs more, it is an incredible antenna. It works on the big radios like the Stryker and rivals the cheap antennas which cannot run Strykers or the big series radios. Wrong order – unfortunately, I received a Wilson 1000, instead of the 5000. Great product – this is a great CB antenna for use in the Oil industry. Its peak reaches a long distance while maintaining a high level of clarity. 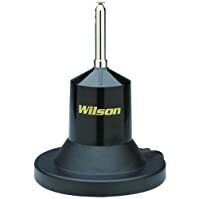 The Wilson 5000 Magnet CB Antenna has a maximum efficiency above that of the Wilson 1000, and it is also 65 percent larger than the Wilson 1000. The 5000 is also high powered in comparison to Wilson 1000 CB antennas. Also, the Wilson 5000 has a 6-gauge solid copper silver-plated wire, and Wilson 1000 has a 10-gauge solid copper silver-plater wire. The former is more effective. Antenna Power Gain: this refers to the amount of improvement in the power amplification over another antenna. A higher-gain antenna will transmit and receive signals further, although the distance varies depending on the gain as well the ground terrain and other environmental features. Test results for the antenna will vary depending on your vehicle’s ground plane, and the matching configuration. If you’re having issues with the antenna’s height, and you need it shortened, you should get the Wilson Short Load. The Wilson Short Load offers a high level of efficiency, performance. It is only 39 inches long, compared to the 62 inch whip for the Wilson 5000. You cannot go wrong with this high-powered and durably-designed Wilson 5000 Magnet CB Antenna. Yes, it is expensive compared to most other CB antennas on the market but, its built-design makes it easy to use on any CB radio and also in severe icy weather. I don’t know about the performance of the Wilson 5000, but I like how well the 1000 performs. One caveat of the Wilsons, at least in the 1990’s product, was the use of very cheap & flimsy RG-58 coax that came with the magnet mounts. That, would easily break every time on folks. Once you’ve replaced that OEM coax with a better RG-58, or I’ve even used Mini-8, then you had a damn good antenna set up.